And there came a day, a day unlike any other, when Earth’s mightiest heroes and heroines found themselves united against a common threat. 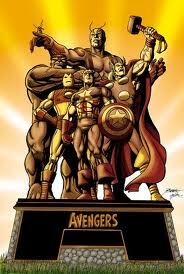 On that day, the Avengers were born—to fight the foes no single super hero could withstand! Through the years, their roster has prospered, changing many times, but their glory has never been denied! Heed the call, then—for now, the Avengers Assemble! Why am I a fan? Why does the world of “super heroes” appeal to me so much? Why am I attracted to that which is considered to be childish and immature?